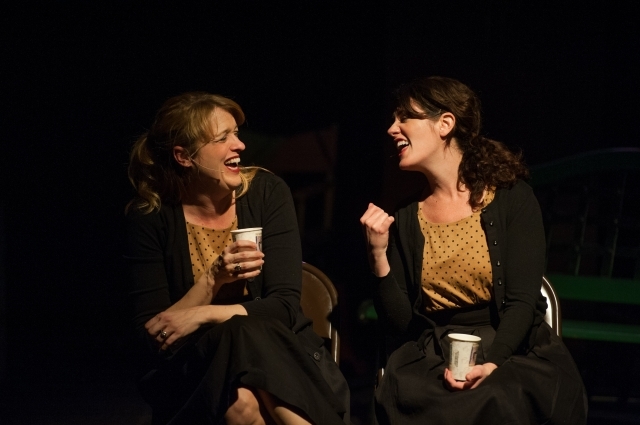 Shanan Custer and Carolyn Poole in “2 Sugars, Room for Cream.” Photo by Mark Vancleave. Two Sugars, Room for Cream is a prime example of the importance of arts institutions for developing promising new work. After the two-woman show created and performed by Carolyn Pool and Shanan Custer became a comedy smash hit at the 2009 Minnesota Fringe Festival, it was expanded the following year at Illusion Theater’s well-regarded play development Fresh Ink Series. For the current run at the New Century Theatre, directed by Peter Moore, some scenes were cut and some short ones were added. Custer and Pool come from different performance backgrounds. Custer, a veteran of the esteemed Brave New Workshop Comedy Theater, has been a star on the local comedy scene for years. She was also terrific in Dudley: Rigged For Laughter at History Theatre a few years ago. That show paid tribute to Brave New Workshop founder, Dudley Riggs. Pool is known for her marvelous serio-comic performances from straight plays in productions of Born Yesterday, The Sisters Rosensweig, and August: Osage County at Park Square, not to mention a fine dramatic turn in Three Days of Rain. New Century Theatre, 615 Hennepin Ave, Mpls.